Take the N2 North Coast and continue north to Stanger. Go through one tollgate (Tongaat Plaza). About 5km after the tollgate, take the Ballito/Compensation off-ramp. At the top of the off-ramp, turn right towards Ballito. Drive approximately 1km until you get to a set of traffic lights. Turn right onto the M4 back towards Durban. Take the N2 North Coast off-ramp and continue north to Stanger. Go through one tollgate (Tongaat Plaza). 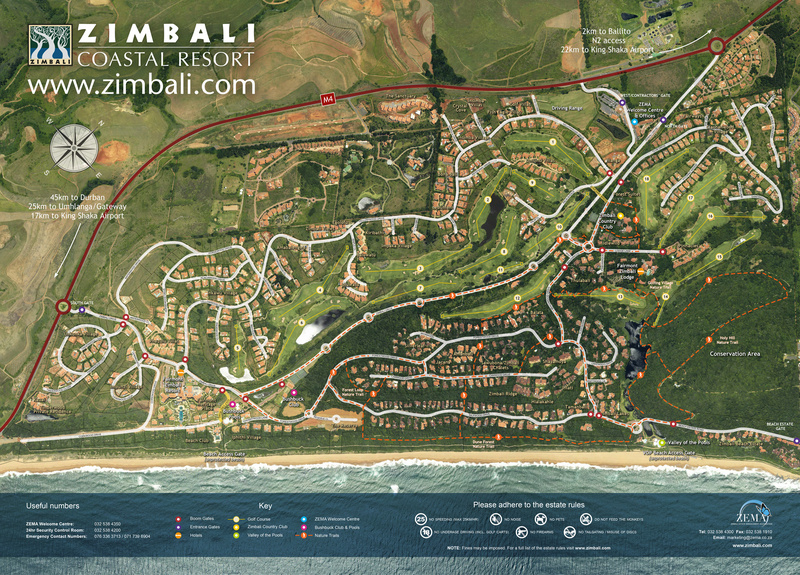 The entrance to Zimbali Coastal Resort is situated 2km down the M4 on your left-hand side. Take the M4 travelling north towards Ballito. Pass La Lucia, Umhlanga Rocks, La Mercy, Desainager, Tongaat and Westbrook. Zimbali Coastal Resort is 5 minutes drive from Westbrook on the right hand side.